Check out this blog post from one of my cyber artist friends who happens to be one of the best plein air painters around IMHO... Marc Hanson. January 2010, the city of New Bern will begin its year-long 300th Anniversary Celebration. 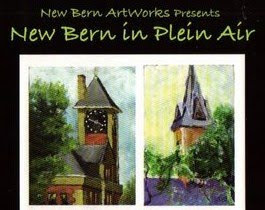 During the month of May 2010, New Bern Artworks & Company will have an exhibit of 300 paintings done “en plein aire” to artistically celebrate the city’s anniversary. The exhibit will be advertised statewide as an event related to the tercentennial celebration and we expect substantial gallery traffic and sales. The opening reception will coincide with the May 2010 New Bern Artwalk evening and all pieces on display will be for sale. This exhibit is open to all artists. Paintings must be painted within the New Bern city limits, be completed between September 2009 and April 2010, and be hand delivered to the gallery before Friday, April 9, 2010. No work will be accepted after this date. The exhibit will be limited to 300 paintings. Similar to last year’s successful plein aire exhibit, Martha Williams, founder of Artworks, will oversee the jury process. Paintings not accepted for the exhibit must be picked up by April 23. New Bern Artworks & Company is not a large gallery so we ask that paintings be no larger than 11” x 14” or 154 square inches, with smaller being better. In order to use as little wall space per piece as possible the paintings should be unframed, and to maintain some uniformity, the sides should be painted black. The gallery usually has about 110 paintings on display so the visual impact of 300 paintings should be memorable. The original concept for Artworks was a gallery where the paintable surface was a wooden box and a majority of the work currently on display is done in that manner. The box format allows the participation of most mediums with watercolor, pastel and colored pencil being completed on the appropriate surface which is then adhered to the box. There are many examples in the gallery. The gallery has on hand a supply of standard sized boxes and will offer them at a discount to participating artists (please mention when visiting the gallery). Dixieland Delight... Indoors for our January Paint Out! The Onslow Outdoor Painters Society (OOPS) enjoyed the comfort and WARMTH of the indoor studio as they opted for a new January paint out tradition... an indoor life class. This years model was Jeremy a Civil War reenactor posing in his authentic Confederate uniform with accoutrement's. Thanks Jeremy for such an AWESOME job modeling for us! 9 OOPS artists (Dean, Stephen, Pat B., Cass, Sherry, Mitchell, Bernie, Tom and our newest member, Ann, from Wilmington) attended the life class and are featured in the video below.... January 10, 2010. WHAT: FREE Workshop for OOPS members by Bernie Rosage Jr. Due to limited space this workshop is only open to OOPS members. COLOR THEORY: Practical tips on C O L O R for the plein air artist. Bernie will discuss hue, value and intensity, color temperature, color harmony with practical limited palette choices for the field, color mixing, compliments and graying/dulling color, we will navigate the color wheel in 3D to gain a better understanding of color mixing options, plus more! More details and materials list coming soon. WHEN: Sunday, February 21st, 2010 beginning @ 1PM. WHERE: The Council for the Arts, 826 New Bridge St, Jacksonville NC 28540. Mark your calendar for January 10, 2010! COOL paint out planned! Be sure to mark your calendar for a special painting treat for our January paint out. We will dodge he COLD by painting inside... the subject... a LIVE person! I realize that a life class may seem intimidating to many but look at it as a way to challenge yourself and learn by doing something different. I think there are only handful of portrait artists in our group so this will be a challenge for most... myself included. Our live model will be Jeremy... he will dress in a Civil War period uniform which will make for a cool character study. He will sit for the study from 1PM till 4PM so make plans to arrive on time to get a good spot. The session will be held indoors at the Council for the Arts on New Bridge Street... Connie Wenner was kind enough to allow us to use the studio room. We will pass the hat to take up a donation to give to Jeremy for so graciously volunteering as our model. WHAT: OOPS November "Paint Out"... A LIVE model life class INSIDE! WHY: Dodging the COLD and challenging our portrait skills! WHAT ELSE: We will pass the hat and ask for a donation to give to our model, Jeremy, for volunteering to model for us... 3 hours is a long time to pose. WHAT ELSE #2: Dutch treat dinner afterwards at a restaurant we decide on.